Only two months ago, a large question mark hung over the fate of Ridley Scott’s All The Money In The World. We all know why and we all know what happened next. Rather than have his film shelved, the director reverted to his original choice of Christopher Plummer to play billionaire J Paul Getty and re-shot his scenes in just six weeks. A bold, audacious move for a film about an equally audacious kidnapping in the early 70s which was played out over five months, saw the victim lose his ear and the ransom decline from an initial $17 million to just under $3 million. Snatched in Rome, John Paul Getty III (Charlie Plummer) is the teenage grandson of the world’s richest man, J Paul Getty (Christopher Plummer – no relation). His captors assume that the boy’s family will pay up without a fuss, but they haven’t taken the old man’s miserly nature into consideration. He refuses. It’s left to the boy’s mother, Gail (Michelle Williams) to lock horns with her ex-father in law to secure her son’s release and help comes in the unlikely form of Fletcher Chase (Mark Wahlberg), initially employed to represent Getty’s interests. It’s hard to imagine anybody else playing the older Getty than Plummer, such is the strength of his performance. He’s masterly as the mean fisted and mean spirited man who places his faith in objects, not people, because they never disappoint him. Or so he believes. He’s an object lesson for sticking with your first choice. 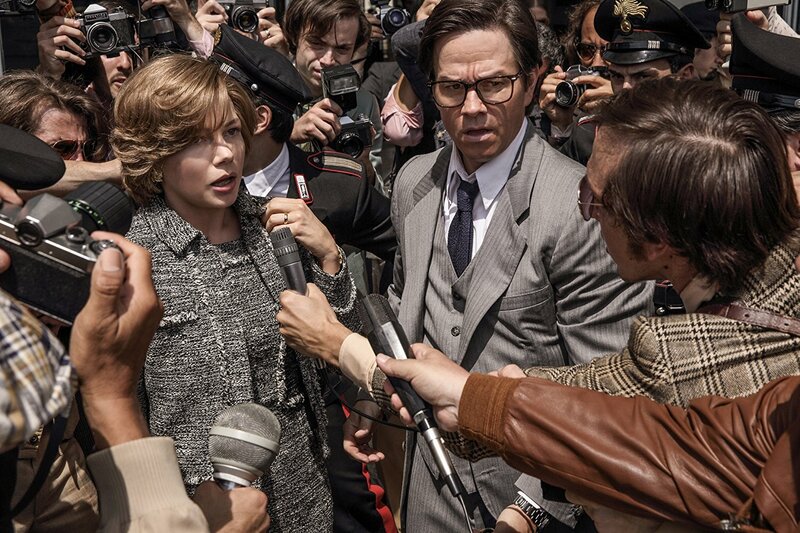 In fact, acting is the film’s biggest plus point with Michelle Williams providing a more than worthy adversary: she has all the heart that Getty lacks, but just as much guile and determination and eventually finds herself playing the old man at his own game. Wahlberg is suitably enigmatic as security man Chase, initially willing to do anything for his fee but slowly changing his mind. If there’s a weak spot, it’s Charlie Plummer’s John Paul Getty III and it’s not so much down to his performance as the writing. His first scenes show him living a bohemian lifestyle, but with a cocky attitude that doesn’t endear him to anybody. Once he’s kidnapped, that soon fades away and he becomes a pathetic figure, there to garner your sympathy and little else. While Scott aims to give us a kidnap drama, it doesn’t wholly work on that front. It desperately needs more tension, and that means more editing than he crammed into those six weeks. As it stands, it’s disappointingly flabby in places, and turns out to be more of a morality tale, with the kidnap as the catalyst. There’s an operatic feel to proceedings, one that traces Getty’s slow realisation that there’s more to life than just money and materialism. And that life will always catch up with you in the end. Something of an eyebrow raiser, given the film’s well-documented history. All The Money In The World isn’t quite Ridley Scott at his best, but it’s far from his worst. His second best is well ahead of many other directors at the top of their game and the film, despite the moments when it sags, has more than enough to hold on to your attention. He was right. The film deserved to be saved, was worth all the effort and he got the actor he wanted in the first place. He wins! All The Money In The World is out on the 5th of January.